I have not posted anything I have painted for while so am about to rectify that. Since my last post I have completed three battalions. The first is a fictional battalion from the book Sharpe’s Battle and the TV episode of the same name. 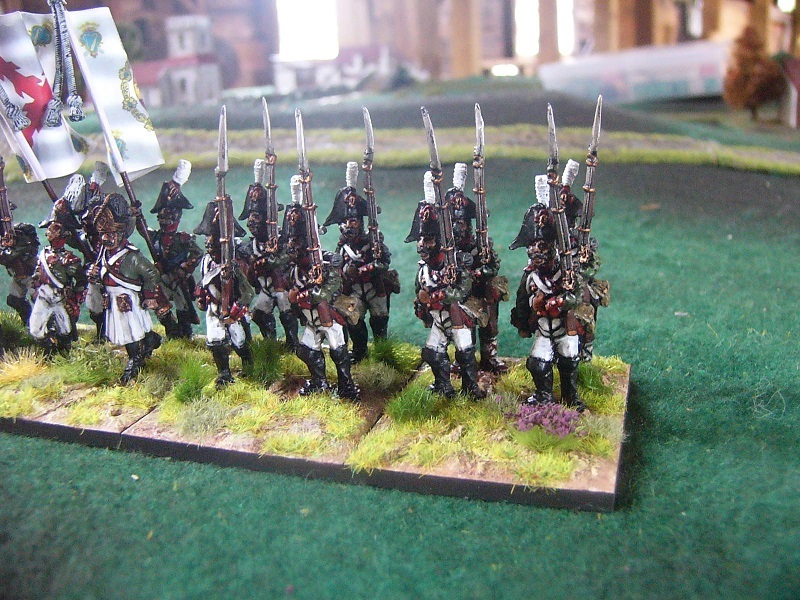 I was getting a little sick of painting Spanish white uniforms so thought – why not. They wear a green jacket with red facings, and a white plume on their bicorne. In the book the Real Compania Irlandesa is described as a battalion, but in the TV series there about thirty guys who manage to be the entire unit, despite the casualties and desertions the battalion suffers in the course of the story. Figures are Elite Miniatures with a Front Rank sapper and a solitary Connoisseur Spanish infantryman from Bicorne Miniatures. I added a Grenadier company in bearskins. The TV episode showed some grenadiers in bicornes but I figured my version would have traditionally attired grenadiers. You may notice a Front Rank Spanish Sapper included. Roly (from Dressing the Lines) gave me a bunch of odds and sods leftovers from his Peninsular project and this is the first figure I have used from that lot. The Connoisseur Spaniard is the infantryman next to the sapper in the picture below. The Real Compania Irlandesa in Attack Column. Flags are PDF prints from Captain Miniatures. They are actually the flags for either the Ultonia or Hibernia regiments – I am not sure which – but who will notice? Very Nice Brian – I do like the Elite Miniatures figures and have a stack of Connoisseur Spanish that I am preparing at present for some painting.. That was a great Sharpe Episode by the way and still go through the series on flights to Sydney. Very enjoyable. Similar to yourself I am preparing for a bit of a return to the Peninsula as well. hanks for posting such a lovely unit. Thanks Carlo. The Connoisseur Spanish are nice sculpts and fit perfectly with these Elite Spanish. I got my Elite miniatures from Vinnie in Queensland. 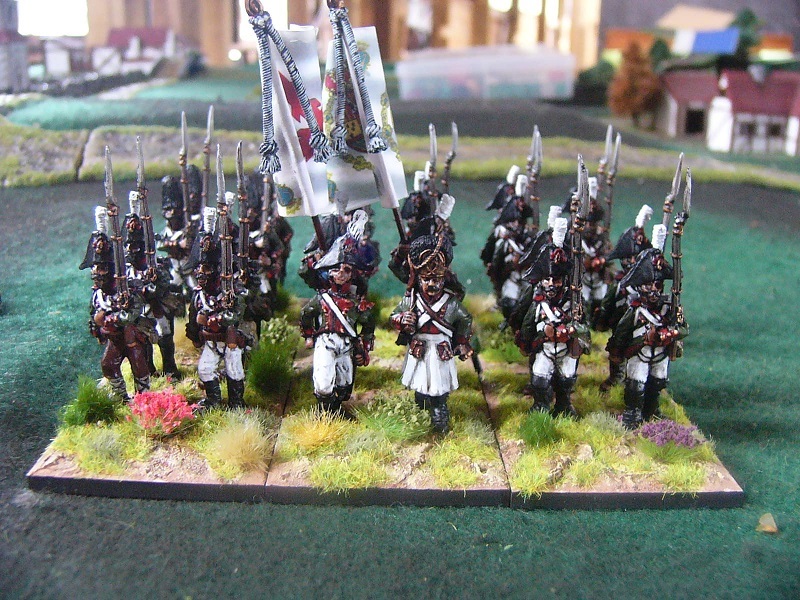 Will be using a mixture of Connoisseur and Elite for the rest of my 1808 Spanish Guard Infantry. 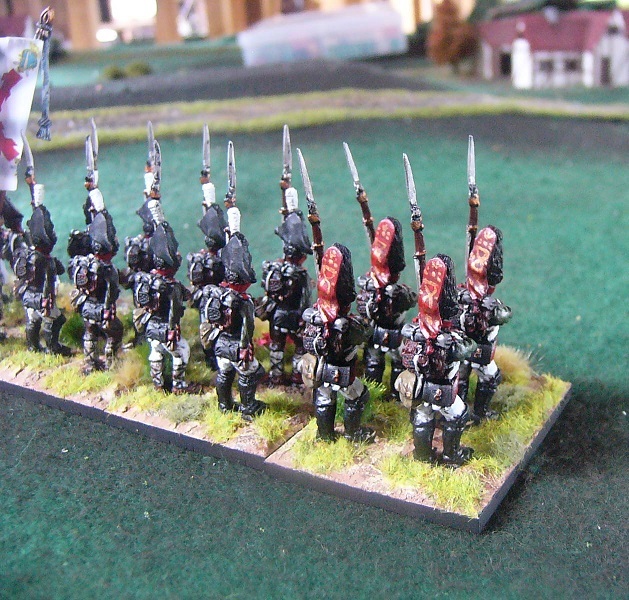 Fantastic work on this unit…I have painted it many years ago in 15mm, but your work is much better! Thanks for that. Appreciate it.